The CDF has carried out research for the conservation of the Galápagos for 50 years. The mission of the GNPS is to protect, conserve and manage the Archipelago ecosystems and its biological diversity. People at both the CDF and GNPS have been pivotal by providing their technical, logistic, and scientific expertise. Is at the Dipartimento di Biologia, Università Tor Vergata, Rome, Italy. She is a post-doc in Gabriele’s lab in Italy. Is a professor in herpetology, specialised in evolutionary and functional ecology, conservation biology, and island biology. He was at the Charles Darwin Foundation and is now at the University of New Mexico. Is works on ecology, animal behaviour, and the history of field research in the Galapagos Islands. She is at the University of New Mexico. Provided samples that she collected when she was in Diethard Tautz’ lab in Germany. (iii)the five different management units exhibit considerably different levels of intra-population genetic diversity, with the Plaza Sur and Santa Fe populations particularly low. 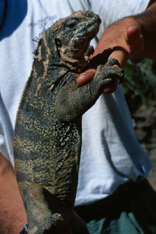 Although the initial captive breeding programmes, coupled with intensive efforts to eradicate introduced species, saved several land iguana populations from extinction, our molecular results provide objective data for improving continuing in situ species survival plans and population management for this spectacular and emblematic reptile. The Galápagos land iguanas form the sister taxon of the Galápagos marine iguanas (Amblyrhynchus cristatus), from which they diverged 10 - 20 million years ago. Given that the present-day islands are less than 1 million to 4 million years old, the split between Galápagos land and marine iguanas either occurred on older, now submerged, islands of the Archipelago following a single colonization event from the mainland, or the two genera may have split prior to colonizing the islands. Despite their ancient divergence, marine and land iguanas are still capable of hybridizing and producing viable offspring (see picture on the right: an hybrid between land and marine iguanas). Land iguanas comprise two recognized species: Conolophus subcristatus, which naturally inhabits five islands (Plaza Sur, Baltra, Santa Cruz, Isabela, and Fernandina), and C. pallidus, which is restricted to the island of Santa Fe (cf. map below). In addition, there are three translocated populations of C. subcristatus (Islote Caamano, Islote Venecia, and Isla Seymour Norte). 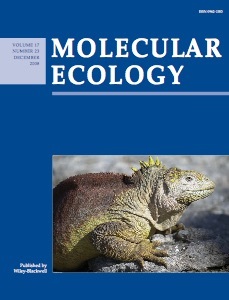 Contrary to Galápagos marine iguanas, no extensive population analysis based on molecular genetics data had been published for land iguanas. However, morphological analyses challenged current classification and identified three possible distinct groups that may warrant species status: animals from the eastern island of Santa Fe, the central islands (Santa Cruz, Baltra and Plaza Sur) and the western and youngest islands (Isabela and Fernandina), respectively. Most populations of land iguanas, perhaps with the exception of the ones of Fernandina and Plaza Sur, are experiencing, or have experienced, various anthropogenic disturbances since the arrival of buccaneers in the 17th century, and whalers and settlers in the early 1800s. Besides human predation, introduced animals, such as goats, burros, pigs, cats, dogs, and rats, represent a great threat, as they compete with iguanas for food, destroy their habitat and/or prey on them. The impact of predation on iguanas is particularly pronounced because both juveniles and adults are vulnerable, which is not the case, for example, for the Galápagos giant tortoises (Geochelone nigra) facing similar threats in terms of competition and habitat destruction but which escape predation once they reach a sufficient size. 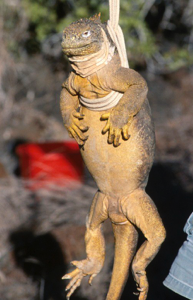 For example, the Santa Cruz land iguana population of about 1000 individuals (Conway Bay and Cerro Dragón) was nearly exterminated within less than 1 year in 1976 by feral dogs. The 56 remaining iguanas found at Cerro Dragón were transferred to the Charles Darwin Research Station to initiate a captive breeding programme. Please, check the full publication for an account on the history of all land iguana populations. Clearly, past captive breeding programmes, coupled with intensive efforts to eradicate exotic species, saved several land iguana populations from extinction. In total, more than 700 captive-bred land iguanas have been repatriated on the sites of Baltra, Isabela, and Santa Cruz. Their survival to adult size has exceeded an average of 40% for the three populations and in situ reproduction occurs at all three sites. However, the captive breeding programmes and the reintroduction plans did not rigorously incorporate pedigree information or molecular genetic data, such that the level of genetic diversity in the captive and repatriated populations was unknown. This situation might be paralleled to that of the Galápagos giant tortoise population found on the island Española which has experienced massive repatriation efforts. We investigated genetic variation at nine nuclear microsatellite loci among 703 land iguanas from all islands where they occur today. We also genotyped 20 marine iguanas at the same loci for comparison. Molecular data could prove of paramount interest for improving management of ex situ captive populations and for guiding the development of proper in situ population survival and habitat management plans for this spectacular reptile. 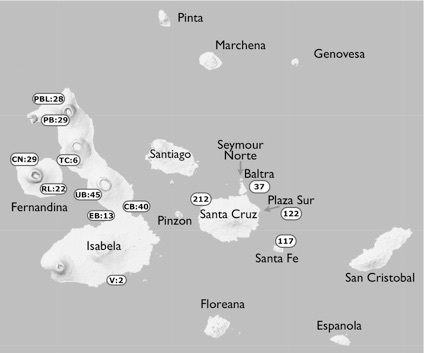 Between 1997 and 2006, 703 blood samples were collected from all islands where land iguanas occur (the figure on the right indicates the number of samples obtained, and their locality). Nuclear DNA variation was assessed at nine microsatellite loci that we isolated from a genomic library of a Conolophus subcristatus individual from Plaza Sur. We used the softwares “Convert”, “fstat v2.9.3”, “Arlequin v3.1”, “Bottleneck v1.2.02”, “Structure v2.2”, and “SPAGeDI” for assessing genetic diversity and demographic history parameters (see full paper; Molecular Ecology 17, 4943–4952 ; for much additional information). Genetic diversity and demographic history. Deviation from H-W equilibrium was observed for some loci of the Santa Cruz and Isabela populations. H-W deviation in Isabela is likely due to the presence of subpopulations (see below), whereas the Santa Cruz population does not fit expectations of random mating in a large population as all individuals originate from the few founders of the captive breeding programme. There is no evidence of linkage disequilibrium among loci. All diversity indices indicate that Fernandina and Isabela are the most polymorphic populations, Santa Fe and Plaza Sur are the least polymorphic, whereas Santa Cruz and Baltra show intermediate values (see full paper). More than half of the private alleles in Isabela belong to individuals of the rosada form. Bottleneck analyses did not evidence any significant reduction of population size. On the other hand, Garza-Williamson index values are low, suggesting past population size reductions. “Structure” analyses, based on the nine microsatellites genotyped in all 703 individuals sampled on all islands where Galápagos land iguanas occur today, indicate an optimal clustering into four distinct groups (see Fig.a,b on the left), with an average assignment probability of 0.95. One of the four groups corresponds to the Santa Fe population, an expected result given that these animals have long been considered as a separate land iguana species (Conolophus pallidus). The remaining three groups are much more unanticipated as they consist of: (i) Plaza Sur, (ii) (Isabela + Fernandina +Baltra), and (iii) Santa Cruz individuals. Note that the clustering of Baltra with (Isabela + Fernandina) is less supported in 3 out of 10 “Structure” runs performed with K = 4. In these cases (e.g. Fig. b above), the 37 Baltra/Seymour Norte individuals are still assigned with the highest probability (65%) to (Isabela + Fernandina) but also with 30% to Santa Cruz. (ii) all remaining Isabela (yellow) individuals. Note that a very significant differentiation of the Piedra Blanca group has also been suggested by the analysis of molecular, morphological, and behavioural data. The validity of the clusters identified by “Structure” was further confirmed by FST/RST values. Interestingly, the rosada group is the most differentiated as it even exhibits pairwise RST values larger than when comparing marine iguanas with any population of land iguanas. Note that the rosada population is distinct from the remaining populations mainly due to the numerous private/diagnostic alleles at one single locus. Note also that the AMOVA tests do not fully capture population structure unless the rosada form individuals are considered separately (‘among populations’ variation increases from ~30 to 65%). In the past two centuries, land iguana populations throughout the Galápagos Archipelago have been confronted with numerous threats, sometimes resulting in severe population declines. Conservation activities based on captive breeding have been established and saved several populations from extinction. However, information crucial for population management, such as population genetic structure within the genus Conolophus and the levels of genetic diversity displayed by these perturbed populations, was largely unknown. Here, using nine species-specific microsatellite loci, we identify four clusters corresponding to Santa Fe, Plaza Sur, (Isabela + Fernandina) and Santa Cruz. 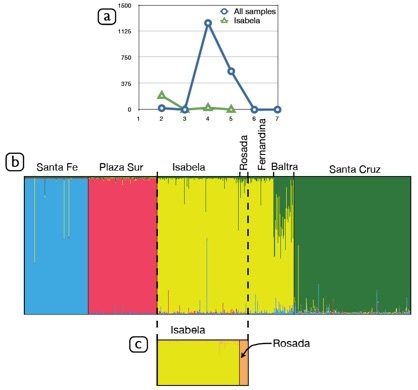 The surprising differentiation of the Plaza Sur population is strongly supported by the molecular analyses, whereas the Baltra/Seymour Norte population exhibits mixed ancestry with both (Isabela + Fernandina), and Santa Cruz populations (Fig. b above), a result that probably reflects the true recent history of the mixed Seymour Norte population as a consequence of undocumented translocations of individuals in late 1976 and early 1977, at a time when iguanas from Cerro Dragon on Isla Santa Cruz and Bahia Conway on Isla Isabela were removed from the field where large numbers of iguanas were rapidly being killed by feral dogs. Finally, the striking differentiation of 15 animals sampled at the most northern part of Isabela is remarkable. The distinctness of these iguanas, dubbed the rosada form, has also been suggested by mitochondrial, morphological, and behavioural data (G. Gentile et al.). Clearly, the status of the various land iguana populations should be carefully reconsidered. For example, the Plaza Sur population and rosada form might warrant separate species status (although this result would require confirmation using phylogenetic approaches) as their levels of differentiation approach or exceed those of the Santa Fe recognized separate species of land iguana, or even that of the marine iguana. Correlation of genetic data and population history. As Fernandina and Plaza Sur populations have not been exposed to a significant level of predation or competition by introduced species, both islands were expected to exhibit high levels of genetic diversity, a condition indeed observed for Fernandina but not for Plaza Sur. A possible explanation would be that El Niño events have a higher impact on Plaza Sur because of the island’s small size (12 ha) and dense population (53 iguanas/ha), causing larger fluctuations in population size than on larger islands. Indeed, the heavy rainfall of an El Niño event first favours the growth of the prickly pear cactus Opuntia, the main source of food of land iguanas, causing the expansion of the population of iguanas. After the El Niño event, the increased population size of iguanas and the shortage in rainfall may cause the Opuntia population to decline, potentially resulting in a later reduction of the land iguana population. If Plaza Sur, given its size and topography, is particularly impacted by El Niño events, recurrent occurrences of this climatic phenomenon might indeed explain the low level of genetic diversity, and the high degree of differentiation, of the current Plaza Sur population. The population of Isabela displays a high diversity level despite the fact that several central populations have been threatened for over 100 years since the introduction of feral dogs. Although our “Structure” analyses only discriminate the rosada form, high diversity levels in Isabela could be due to hidden population structure, as demonstrated in the giant Galápagos tortoises. This point warrants further investigation. Baltra and Santa Cruz populations display intermediate levels of diversity despite their recovery from 70 and 56 individuals, respectively, after quasi-extinction events (see “History of land iguana populations“ above). The lowest diversity level is in fact exhibited by the Santa Fe population, an observation that can be explained by two parameters: this population (i) has been largely affected before 1970 by human predation and competition with goats, and (ii) has not been restored (contrary to those of Baltra, Santa Cruz and Isabela) by individuals generated by captive-breeding programmes. Our analyses suggest that the situation on Plaza Sur and Santa Fe should be investigated further, so as to identify the causes of low levels of genetic diversity. Even if these populations are not under immediate threat, reduced genetic variation and low effective population size can make the population more vulnerable to environmental changes (including infectious diseases), demographic stochasticity, or human-related disturbances. The degree of genetic differentiation found among the islands where land iguanas occur today is surprisingly high in comparison with that observed between land and marine iguanas. Differentiation among land iguana populations is also higher than that observed among marine iguanas from different islands. This difference in genetic differentiation can obviously be explained in terms of differences in habitat: while marine iguanas are potentially able to easily migrate among different islands, land iguanas cannot swim. It is, therefore, likely that land iguanas can only cross water, even a few hundreds metres, through rafting. Note that the Komodo dragon, which presents geographic differentiation patterns and inter-island migration aptitudes similar to those of land iguanas, displays a similar level of differentiation among islands. evolutionary history of the rosada form, as it is found on a young island but is greatly differentiated from all other populations. A possible explanation is that these individuals originate from a now-extinct population from another island. Besides the obvious candidates — Santiago, that has been inhabited by iguanas, and Pinzón, that lies between Santa Cruz and Isabela — other islands, now-submerged due to fluctuating sea levels, might have hosted land iguanas in the past. 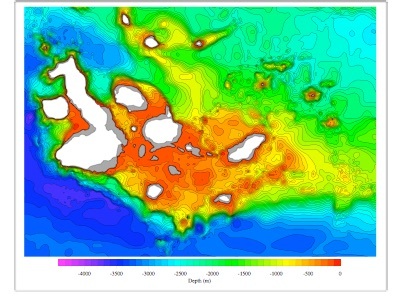 The figure on the right shows the additional islands and the expansion of current land masses caused by a 100-m decrease in see level, similar to the one that took place during the latest glaciation. (iii)the populations from distinct islands exhibit considerably different levels of genetic diversity, with two populations (Plaza Sur and Santa Fe) more particularly at risk. Note that, although the fate of Santa Cruz, Baltra, and Isabela populations has been largely improved, thanks to past and existing conservation programmes, the polygynous reproductive strategy of land iguanas translates into lowered effective population sizes, stressing the need of continuous and effective management.